This is it, guys. This is the book that got me interested in death. 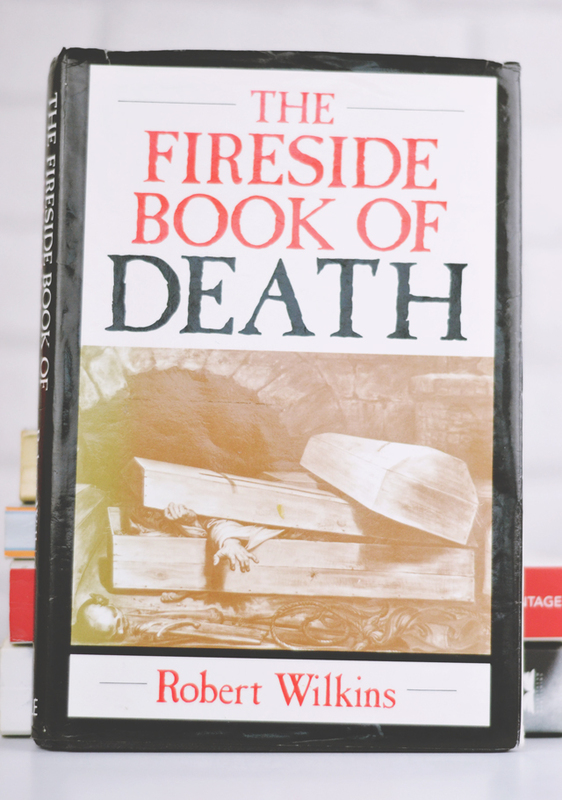 When I was about 8, I'd read The Fireside Book of Death from cover to cover and this summer, my dad gave me his copy. It was an emotional moment, I can tell you! The Fireside Book of Death, despite its broad name, has quite a narrow focus: The human fear of death. Split into five sections (the fears of premature burial, posthumous indignity, bodily disintegration, being forgotten and ignominious death), each one discusses the steps that our predecessors took to alleviate their fears. The information is drawn from a huge wealth of sources, both primary and modern, and delivered with interesting facts and anecdotes on every page. Wilkins manages somehow to write a book on death that is filled with life. He makes the odd light-hearted, some might say flippant, comment which prevents the subject matter becoming draining, while keeping his authority with how well-researched the book is. Not only are there hundreds of referenced texts (listed in the appendix which makes a good place to start for further reading) but the book reproduces many images, from medieval illustrations to photos of shrunken heads and other preserved bodies. There's nothing too gory but something to be aware of if you're of a nervous disposition! Obviously I find the subject matter fascinating and I really appreciate how the text is structured. Although death fears is quite a niche subject, there are lots of aspects within this area to discuss, so the chapters examine topics as varied as body snatchers, mummification and gravestone design. Essentially, the book is an examination of British death culture from the Middle Ages right up to the 20th century, although other eras and countries are touched on too. Unfortunately, this diverse mix of subjects means Wilkins doesn't go into too much depth and many of the topics are glossed over. Rather than an in-depth examination of areas surrounding death culture, this book is more of an introduction to the general subject, which does allow you to choose those aspects that interest you most and research further. As this is such an interesting, well-researched read that gives a broad look at the culture surrounding death, I'd give it eight out of ten. I thoroughly enjoyed it and I know I'll be returning to it. A fantastic text to use for reference material. If death culture is your thang (it's ok, we're all friends here), I have a list of books surrounding death and crime here that I thoroughly recommend reading! This sounds like a fascinating book, and not one I'd pick up myself. You've intrigued me though, and I want to read it now... Also, I loved how that book looks. You can tell it's been flicked through many times!